How do I get Customer ID to work with Authorize.net Payment wizard? Making the customer ID "not required" is unfortunately not an option for our company. What other way can I have our members use this form and payment without taking away the customer ID? I added it into our form as a field entry and that still did not work. I was able to make it work in my cloned form. Please do make sure to setup your "Invoice Number Field" to your "Customer ID" field. Right click on your "Payment" field and click ""Edit Properties". Make sure to click the "close" button and save the changes before testing the form. If you want to automatically create the customer ID, that is possible by using the "Unique ID" widget. You can check this guide on how to use it: http://www.jotform.com/help/79-Add-Custom-Unique-IDs-to-your-Form-Submissions. You can then use that widget as the "Invoice Number Field" in the properties setting. If you are still getting an error message, please do share us the screenshot of the error so that we can better investigate. We'll wait for your response. I did exactly what you said with the Invoice Number field and I am still getting the attached error. I'm testing the issue with my sandbox account and I'll get back to you once I complete my tests. As I tested with my Sandbox account, I was able to submit the cloned version of the form without any issues. I assume that you might have the Customer ID field has been set to Required on your Authorize.net account settings. 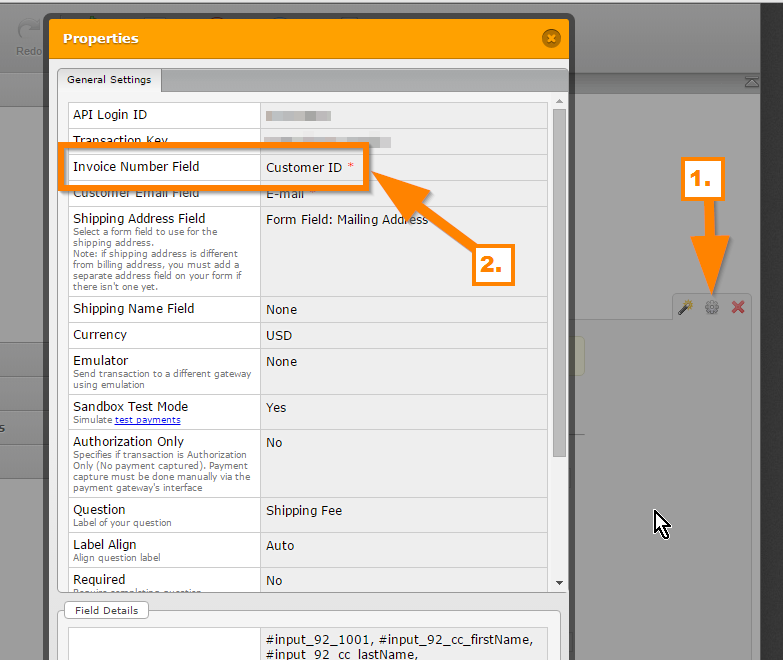 Please try unchecking the required option for Customer ID from Account > Payment Form > Form Fields.